I work with new clients all the time and a common theme is that they’re bored with their current wardrobes. They may have stylish and versatile pieces in their closets, but they always wear them the same way. Does this sound like you? Then it’s time to mix it up! Clients are consistently asking me if a certain item is appropriate for specific occasions. “Will this blouse be okay at work?” “Does this jacket make sense on the weekend?” “Are these my date night jeans?” And my answer remains the same – it’s less about the particular item, and more about what you mix it with. Yes, the blouse is completely appropriate at the office with slim trousers and a cardigan, but it’s also great for a concert with jeans and a leather blazer. Sure, that jacket can be your weekend go-to over a t-shirt, but it can also be your casual Friday option over a striped sweater. And the great news is that you don’t necessarily need to buy more clothes to update your outfit options – if you’re willing to mix up how you wear what’s already hanging in your closet, you can create fun outfits that feel new, fresh and totally different. Read below for 4 ways that you can revive your style without buying anything new while checking out some stylish outfits that I created for my clients. You’re used to wearing color, right? Grab a brightly colored sweater, pair it with jeans, a neutral jacket and boots and you’re good to go. But if that’s how you always get dressed, it’s time to shake it up. Instead of wearing just one bold color and everything else neutral, how about pairing two (or three) fun colors in one outfit? If you’re reticent about color combining, grab a ‘blueprint’ piece – a patterned item with multiple colors that gives you permission to mix any shades from the print. Mustard and coral are a fun color combo, especially when paired with an olive jacket. And when in doubt, metallic shoes are a no-brainer! Green, navy and teal are not only a cool combination, they also create a sophisticated outfit perfect for work presentations. Play with warm and cool shades together with a green top, navy cardigan and pink flats - and multicolored jewelry amplifies the palette. A ‘blueprint’ scarf gives you all the permission you need to pair a salmon pink jacket with a kelly green sweater. Add white cords and it’s an unexpected winter look! Stick with prints based in the same colors. This creates a visual harmony and ensures your look won’t get too busy. Vary your scales. Pick one print in a small scale (like a mini stripe) and another in a larger scale (like an animal print). You don’t want the prints to compete for attention - you want one to stand out more than the other. Start by mixing clothes & accessories. If you’re new to print mixing, try wearing a patterned top with printed shoes. Or pair a floral scarf with a color block bag. Accessories add so much to your look and this is just another way that they can shift your style from everyday to extraordinary. Stripes and dots in grey and ivory create a casual, comfortable and creative outfit for travel. Yes, you can have fun at work by pairing a black and white textured jacket with a multicolored geometric print top. Black pants ground the look, and you can never go wrong with a pop color heel. Stripes and florals are a perennial favorite, no matter the season. Plaid and stripes partner with blush and burgundy for a layered winter look. Just add a wool coat and you’re ready to brave the cold! DRESSY WITH CASUAL, WORK WITH WEEKEND, ETC. Many of my clients have a ‘work’ section in their closet and a ‘weekend’ section. And then some also have a ‘dressy’ section. But if you’re looking to get more mileage (and new outfits) out of your existing wardrobe, you’ll need to blur the lines between sections. Instead of only wearing your velvet blazer to holiday parties, wear it over a turtleneck and jeans to a girls’ lunch. If your ‘power’ dress is only pulled out for big presentations, wear it under a denim jacket on a random Tuesday. Essentially, it’s about mixing casual with dressy, work with weekend and shifting styles from their expected wear occasions into something new and different. 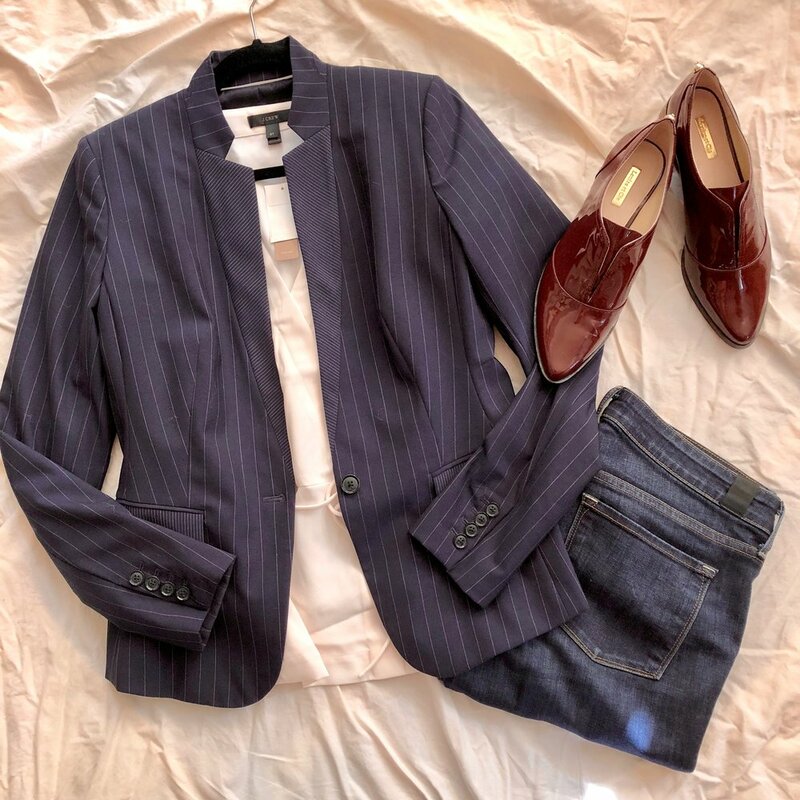 A tailored blazer is key in a business professional wardrobe, but it’s also ideal for casual date night with washed out blue jeans and cute flats. My client loves this floral print blouse, but planned on only wearing it to the office - so I showed her how to pair it with jeans and booties for a movie night with friends. A classic little black dress isn’t for cocktail parties only - add some edge with a cobalt moto jacket and open toe booties for girls’ night out. We all get used to how we wear certain things from our closets, but what better time than the present to wear something in a new way? That sleeveless sweater that’s a layer under your work blazer easily converts to a sweater vest when you pop a white shirt underneath. Your favorite mini skirt looks great with a silk blouse for date night, but also works with a chunky sweater and booties for weekend wandering. And that floral dress that you reserve for summer weddings? Grab a wool blazer, suede boots and cold weather accessories and it’s now a fun option for client meetings in winter. When is a sleeveless sweater not a sleeveless sweater? When it’s a sweater vest! Your summer floral dress becomes winter friendly with a long cardigan, tights and knee-high boots. Rethink your turtleneck sweater - it’s an easy go-to with jeans, but it’s also a stellar layer under a fall dress. A denim jacket moves from third piece to intermediate layer under a chunky drape-front sweater vest. Add skinny pants and boots for a unique winter outfit. 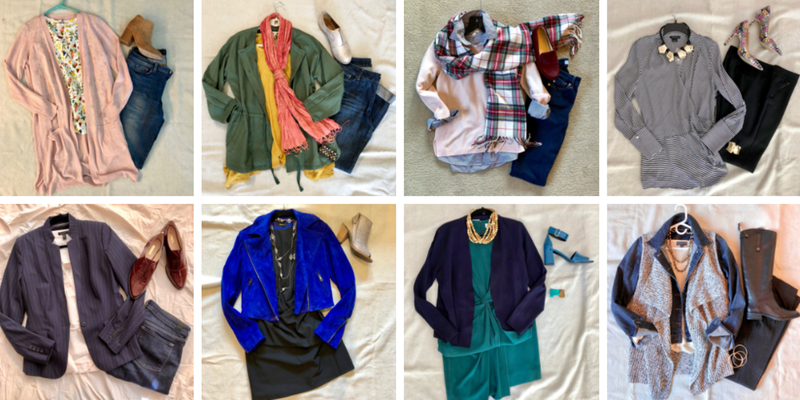 If you’re looking for new outfit ideas and need a fresh eye on your wardrobe, let’s schedule a styling session! Read more about styling sessions here, and contact me to schedule an appointment.